We firmly believe that the healing of Baltimore City and the neighborhood surrounding the Basilica will be achieved through a collective devotion to our Lord Jesus Christ in Eucharistic Adoration. Beginning February 7, 2019 Adoration will be available Thursdays: 8AM – 8PM. It is not necessary that you be a member of the Basilica parish to be an adorer. If you live, work, or visit the downtown area, please take advantage of the opportunity to spend time in prayer in the presence of the Lord. 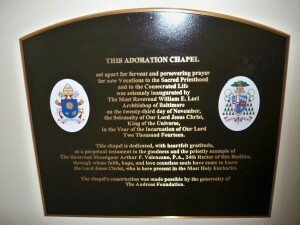 In November of 2014, the chapel was remodeled to reflect it’s connection to the Basilica and dedicated to Monsignor Arthur Valenzano, previous Rector of the Basilica. The altar was installed to reflect the heritage of the 2 apse altars (St. Michael and St. James the Less) by its design and detail including the retabla and tabernacle. 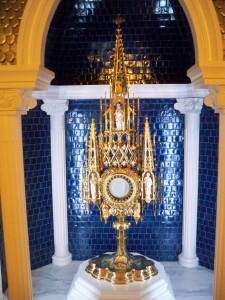 The only major difference was the construction of a dome for the monstrance. 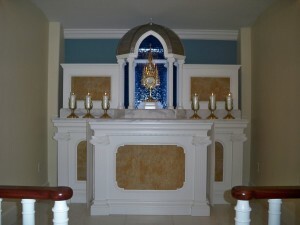 The monstrance itself was restored so that it could be included as a permanent component of the Adoration Chapel. The Gothic-styled monstrance was recovered by a fisherman at nearby Loch Raven Reservoir who thought he had caught a large fish. He brought the damaged monstrance to then Rector James V. Hobbs, who kept it in the rectory until funds were made available to restore it to full use.